The K44 poly-tipped harrows from K-Line Industries are ideal for increasing seed soil contact in the presence of trash. The large high wearing tine which is replaceable along with a fully adjustable angle and a durable steel drum contribute to the success of this process. 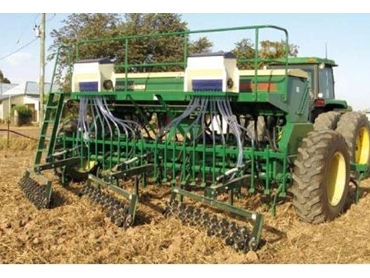 This model, an upgrade of the popular K2000 rotary harrow has been expanded by the introduction of the K44 polymer rotor. With a width of 1.2m-1.8m the rotor can either be mounted on a single arm or a 3000 series multi system. Using the 300 series multi system enables the K44 to be interchanged with the 1000 series spring tine harrows, the 5000 modular coil packers and press wheels.